Blowin’ a Hooley will be bringing Tom Hadaway’s classic play The Filleting Machine to Alphabetti Theatre in Newcastle from Tuesday 28th to Thursday 30th November. The dates are the only chance for Newcastle audiences to see the play in the city. We caught up with Catherine, Micky and Harriet from the play for their five favourite things about the play. -Performing a play in the Geordie accent; The Filleting Machine, set on the Ridges Estate (now the Meadow Well), is written in the Geordie dialect. -There are real fish and chips used in the show… so the actors have to make sure they’re hungry before a performance! -The relevance of the play – despite being written more than 30 years ago, the play still resonates with audiences. -The opportunity to work with young actors – Alice and Davy are played by up and coming actors Virginia Johnson and William Wyn Davies. 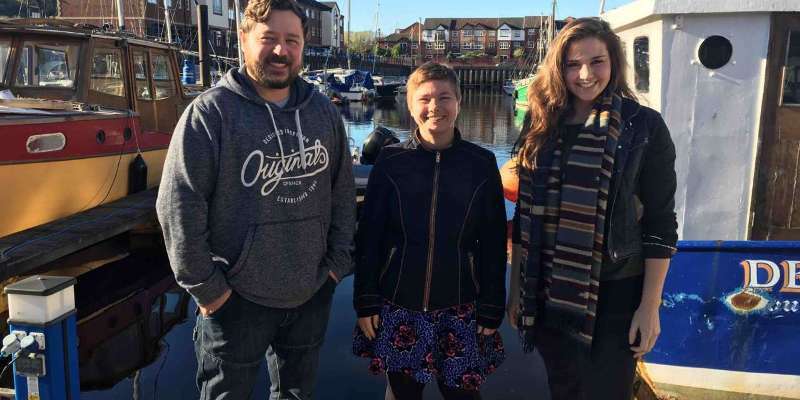 -Visiting a variety of venues; Blowin’ a Hooley set up to tell authentic North East stories and bring high quality theatre to audiences in non-traditional theatre venues, so the cast have gone to working men’s clubs, heritage centres, pubs and libraries. We finish the run in Newcastle’s Alphabetti Theatre and we can’t wait to perform there. The Filleting Machine is at Alphabetti Theatre, Newcastle from Tuesday 28th to Thursday 30th November.